Save a Child’s Heart has conducted another Screening Mission at the Mnazi Mmoja hospital in Zanzibar, from March 4th until March 8th, 2018. This mission was only made possible thanks to support from our sponsors from Save a Child’s Heart Canada. During this mission 318 Children were screened and many will soon need surgery in Israel. 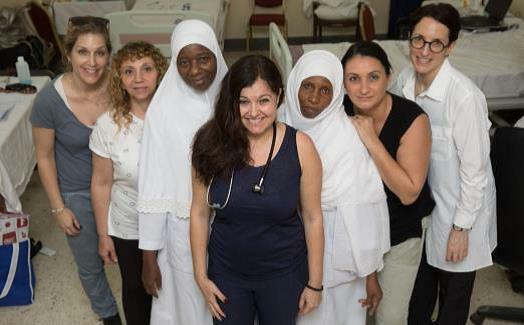 This mission was executed by an all-woman medical team from Wolfson Medical Center, led by Dr. Alona Raucher Sternfeld along with head nurse, Nava Gershon and echo technician, Yifat Brosh. Dr. Omar Suleiman, the head of pediatric cardiology at Mnazi Mmoja hospital headed the Tanzanian medical team. During the very first day of the medical mission, Dr. Alona Raucher Sternfeld and Dr. Omar Suleiman examined more than 88 children. In following days, amazingly, 230 additional children were screened. One the second day of the mission, one of the children examined was a girl named Esther that Save a Child’s Heart knows very well! Esther is a 14-year-old Masai girl who was orphaned at birth. Seven years ago, she traveled from her orphanage in Tanzania to Israel where she underwent life-saving heart surgery at Wolfson Medical Center to treat her rheumatic heart disease. Esther returned to Tanzania and continues to receive regular check-ups to ensure that her heart stays healthy. The medical team was visited by a very special guest during the mission! Zanzibar’s Minister of Health, Hamad Rashid Mohammed, spent a day at the hospital learning about the work of Save a Child’s Heart and showing his support. He is determined to improve health care infrastructure on the Island for cardiac care and looks forward to working with Save a Child’s Heart to do it properly. The Minister is such a fan, in fact, that he invited the team to lunch on the way to the airport and insisted on escorting them to the airport to be sure they made it to their flight on time. We were also honored to have two volunteers from Canada join us, Jason and Rachel Schwartz. They were extremely helpful during the mission, constantly playing with the kids and assisting our efforts. Check out their wonderful blog about the mission here! On the third day of the mission, we got to see another familiar face… little Kharyat! Kharyat is a nowhealthy 6-year-old girl who is full of life. She charmed her way into a full stock of balloons, activities and lollipops. She danced and giggled and ran after bubbles! Two years ago, in 2016, Kharyat received lifesaving surgery at Wolfson Medical Center in Israel. She may need another surgery in the future, but for now she just needs regular follow-up care. Surgery gave Kharyat the chance to live a healthy life. The successes of this life saving mission were made possible by the hard work and dedication of both Israel and Zanzibar’s medical teams along with the support of our sponsors at Save a Child’s Heart Canada.